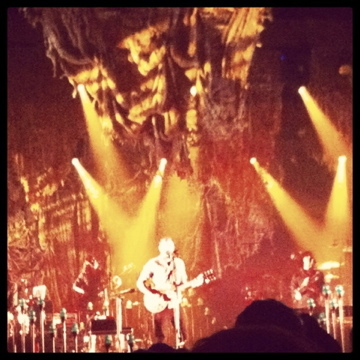 Last night we saw Bon Iver in concert in Calgary. I am a fan, but no one, NO ONE, is as big a fan as MG. You know her from her Now Playing: Pick of the Week posts on this blog. 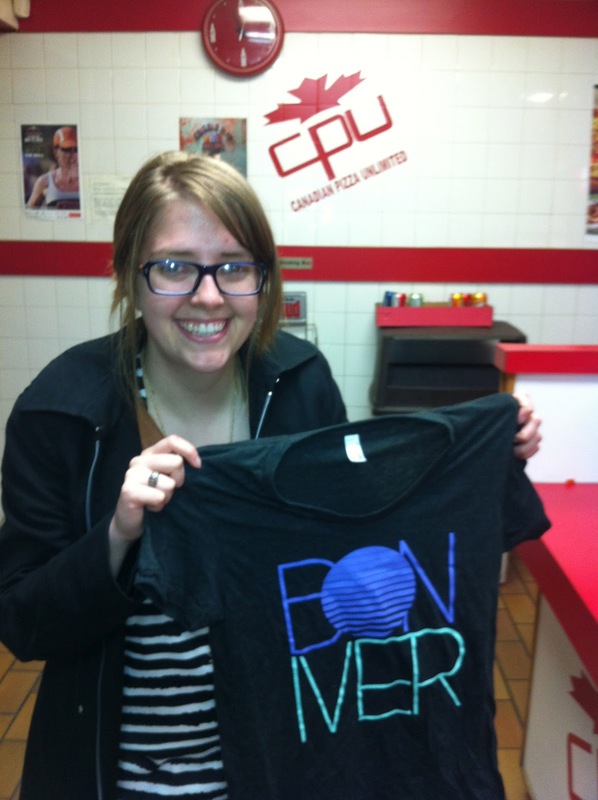 I am sure if I let her, every week would be Bon Iver week, but that is not allowed. Whilst I would ramble on about the ten miles of fake hipsters who were roaming MacHall and the stoner guy who stood in front of us and whipped around every time I put my hand in my purse because he thought I was going to offer him some MJ, I think MG will probably have a more magical story to tell...she did, no lie, fly all the way from Halifax to see this show. I finally got to experience Bon Iver. To say it was a long time coming is an understatement. And to not admit that I was actually having stomach pains from excitement for the past couple weeks would be basically lying to your face. So there I was, after months of anticipation - and a full day of not eating since I was worried I would yak - it was finally time. The opener was a lovely lady group from the UK, The Staves. They were awesome, and such a great compliment for Justin and the boys. Folky and adorably new to Canada. At the beginning of their set they were drinking beer, and the lead singer says “I don’t know what I’m drinking ... cocaine? Co-can-e? Oh! Kokanee!” Just sweet. But I had bigger things on my mind during their banter - like trying to figure out how I was going to navigate my way through the most epic moment of my life (BON IVER!) without completely losing my mind and having to get carried out of MacHall on a stretcher (we did see a girl get carried out by her friends. My money is more on drugs and alcohol than a euphoric mental breakdown, though). And then it happened. Perth! PERTH! I wasn’t entirely surprised that’s how they started out since I’m a bit of a freakshow and had been religiously consulting with setlist.fm to see what they’d been playing at other shows, and I knew that was a pretty popular starter, but it didn’t stop me from losing my cool. It only got better from there. Creature Fear, Re:Stacks, For Emma (unreal acoustic! still dying inside a little from this one), Towers, Holocene, etc. They covered it all. Then there was Justin Vernon, let’s just really talk about him for a second. He is downright endearing. His stage banter was cute and awkward, kind of like what I imagined when I picture how great it would be for us to be best friends and hang out - I have said on occasion ‘it makes me sad I’m not friends with Justin Vernon.’ Before you chastise me on needing to get a life, believe me it’s nothing I haven’t already heard I just want to be his pal, okay? Turns out about ten years ago, after dropping out of college, he was traveling in Ireland and met a guy from Calgary named Paul. Although they don’t see each other often, they’re still close friends and so he wrote the song for him. Someone from this city is doing it right. Now I’m pleased to announce that, although it was touch and go for a while, I didn’t vomit or wet myself. I really had to restrain myself from hopping a fence to hang out outside their tour bus on the way out, but there was a security guard there who looks like he eats people like me for breakfast so I refrained. I really need to get a life. Thank you for paying attention to this banter. Just so you know you’ve read almost 700 words on how I got to see my favourite band without completely freaking out and having a stroke. Congrats on that. For more of MG's musical tastes check out her Pick of the Week posts here.